Jane and Leslie's wedding was reported in the "Delta Democrat-Times" (Greenville, Mississippi) on Thursday, July 23, 19703 (see scan below). Steven Wayne Smith, born Feb 28 1962 (son: Patrick Lee Smith, born Nov 6 1985). Richard Allen Smith, born Mar 24 1968; married Katherine Janelle Chapman, Jun 10 2000 (child: Luke Isaac Smith, Jul 7 2003). "Delta Democrat-Times" (Greenville, Mississippi), Jul 23 1970; http://www.ancestry.com. 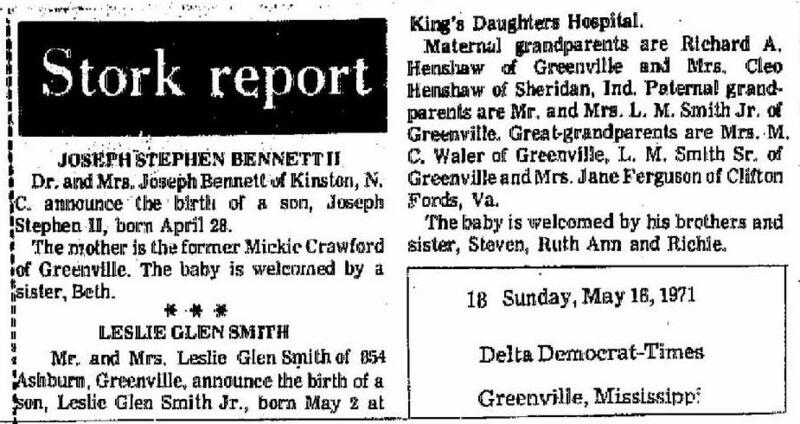 "Delta Democrat-Times" (Greenville, Mississippi), May 16 1971; http://www.ancestry.com. 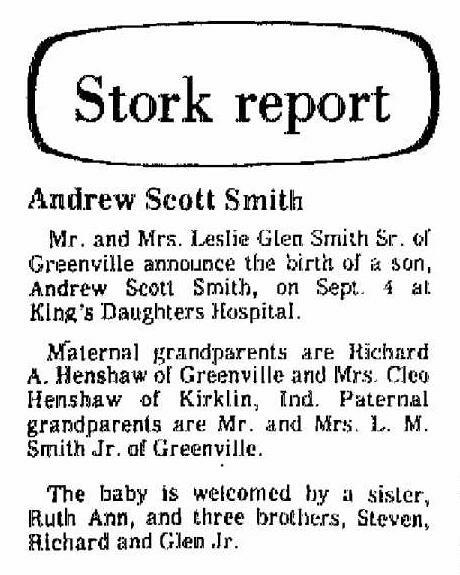 "Delta Democrat-Times" (Greenville, Mississippi), Sep 6 1973; http://www.ancestry.com.